During the Austrian Open of 2007 in Feldkirchen, we had a trip to a nearby “Blumenalm”, the Gerlitzen. From a distance, it doesn’t look like much of a mountain, but much to my dismay, it turned out to be an impressive climb. Since I did not have my bike with me, I was forced to get up by car (or by foot, but I was lazy) and since the car had difficulties getting there, I figured it must be steep. 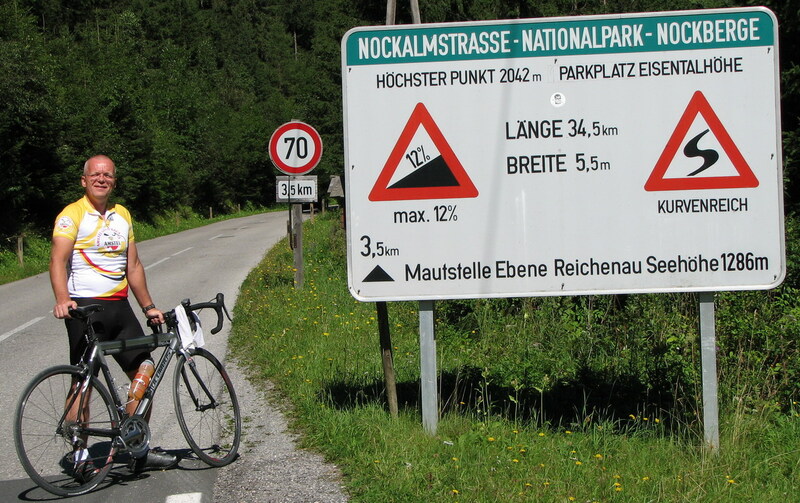 I looked up the profile on ClimbByBike.com and indeed, it was – about 12 kilometers at an average of over 10%. I made a vow I would be back with my bike the next year. This turned out to be a hard climb – I managed both sides (Alpenstrasse and Gipfelstrasse) consecutively, but I was at the end of my rope by the time I finished the last grueling 2 kilometers of gravel road on the Gipfelstrasse. Since I had 1) no experience with anything like this, it was 2) blistering hot and I had not planned and therefor 3) not enough sustenance for the second climb my first mountaineering experience almost became my last. I was beginning to doubt my abilities but I was definitely sure that I had lost my sanity. Climbing the Alpenstrasse had taken me 1:10, for the Gipfelstrasse – although shorter and slightly less steep – I needed 1:15. However, Paula motivated me with a nice brochure about a “biker friendly, winding roller” of a road: the Nockalmstrasse. This would be a nice experience and probably just as good as a recovery ride. Anyway, the next day, near Unter-Winkl at the ‘Devil’s bridge’, I saw the very promising sign and I was about not to get out of the car. Of course, I couldn’t help myself and did so anyway. And although it was far from easy, I got up the first summit at the Glockenhütte (2,024m), had something to eat there, descended 500 meters and climbed up to the second summit at the Eisentahlhöhe (2,042m). 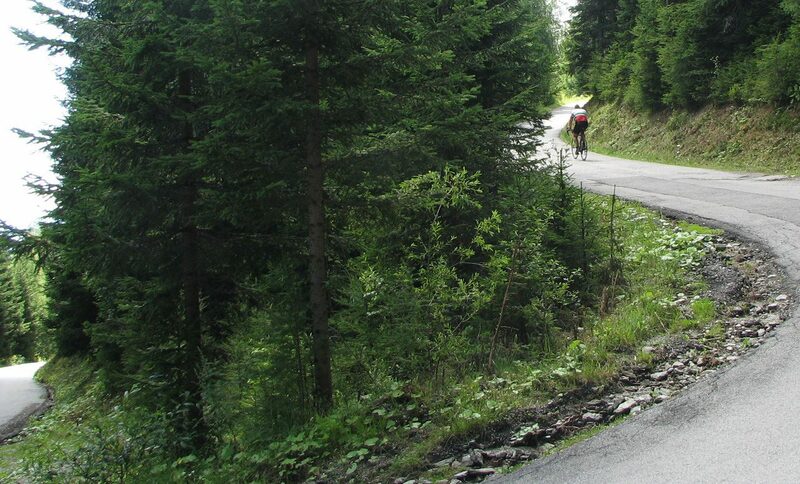 From there, it would be downhill only towards Innerkrems, so I denied myself that ‘treat’ and the chance of crashing. The total of my trip: 25.4 kilometers and 1,416 altimeters over 19 kilometers of climbing – that’s a 7,5% average, with a maximum incline of 18% – in a net time of 1 hour and 50 minutes (profile). The oldest and probably one of the most beautiful passes of Europe. 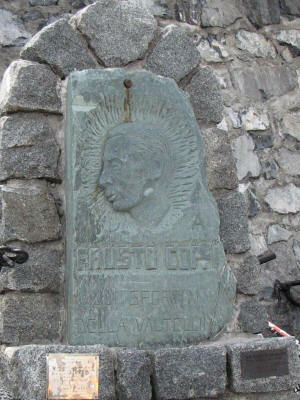 From Prad (or Prato) it is 24.3 kilometers long, with an altitude gain of 1,808 meters. That’s ‘only’ 7.4% average, but you’ll run into steeper stretches more frequently than is comfortable. All in all, this climb is not ‘unfriendly’ – it’s obviously by no means easy, but you can keep going, grind through the harder passages and enjoy (the views on) the less hard bits. I was very lucky with the weather, which can be ‘spooky’ at times, even in August (I was there August 21st). The conditions may vary and it’s not unthinkable that from one day to the next, there will be a snow cover and your trip will be less enjoyable, if not impossible. It took me 1 hour and 44 minutes to cover the 25.3 kilometers from the hotel in Prad and the CicloMaster recorded 1,846 altimeters with a maximum grade of 15%. Once you get to the top, you will be met by the stench of grilled sausages – even if you’re hungry, you won’t like ‘m – and the largest array of (souvenir) shops I’ve seen on any summit so far. You can shoot a picture at the mellow ‘Coppi stage’, but the real monument in his honor (picture left) is on the other side of the street. You can walk around a bit and learn something about the bloody history of the pass, and I recommend Albergo Genziana for much better food than the sausages. Pictures (also of Bad Wiessee and Feldkirchen) on my Google+ page here.